On 4 September 1980, the 1980-built Enstrom 280C Shark c/n 1189 was registered SE-HKX in Sweden with Patria Helikopters AB, Stockholm-Arlanda. On 10 May 1983, registration SE-HKX was cancelled as exported to Germany. In Germany the Enstrom 280C was registered D-HGBX. In 1985, registration D-HAAH was reserved for this Enstrom, but not taken up. 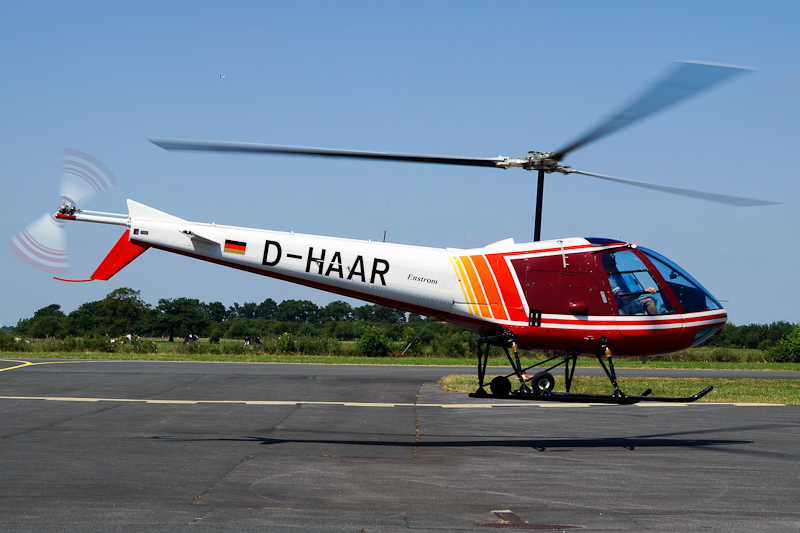 In July 1987, registration D-HGBX was cancelled and the Enstrom was registered D-HAAR with Gerhard Niemann Maschinenfabrik, Melle, Germany. In 2010, Airbus Helicopters EC120 B D-HKDV replaced Enstrom 280C D-HAAR in service with Wilhelm Niemann GmbH, Melle. Early 2011, the Enstrom 280C D-HAAR entered service with DL Helicopter, Hamburg/Fuhlsbüttel. On 23 July 2014, the Enstrom 280C Shark D-HAAR was seen practicing hoover at Flugplatz Leer-Papenburg. On 12 June 2018, Enstrom 280C Shark D-HAAR was severely damaged during an emergency landing in a meadow near Berne in Lower Saxony, Germany. The helicopter had taken off from Ganderkesee for a check-flight: at a height of 600 m the engine suddenly stopped through an unknown cause, after which the emergency landing was carried out. After the helicopter was put right on the skids in the pasture it tipped through the hard landing and the tailboom broke off. Both passengers remained unharmed.